First Data continues to push the market with endless possibilites. The latest pinpad to be released allows your customers to select their payment method at the pinpad. This technology allows the use of Tap and Go credit & debit cards, Micro Chip embedded cards along with NFC enabled smart phones for the ability to pay using your Apple Iphone, Android, and Windows Phone. As the world economy changes, so should your business. 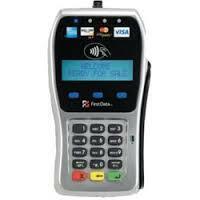 First Data FD35 Pin Pad and Consumer-Facing Device. First Data continues to push the market with endless possibilites. The latest pinpad to be released allows your customers to select their payment method at the pinpad. This technology allows the use of Tap and Go credit & debit cards, Micro Chip embedded cards along with NFC enabled smart phones for the ability to pay using your Apple Iphone, Android, and Windows Phone. As the world economy changes, so should your business.